Primary nocturnal enuresis (PNE) is a common problem in childhood and adolescence. Although various treatments are highly effective, a common underlying hypothesis on the pathogenesis is lacking. The success of desmopressin, a synthetic analogue of the antidiuretic hormone vasopressin, has been attributed to increased renal water reabsorption that is mediated by activation of the renal vasopressin V2 receptor (V2R). However, this effect does not explain other symptoms of PNE, such as the failure to arouse upon bladder distension. 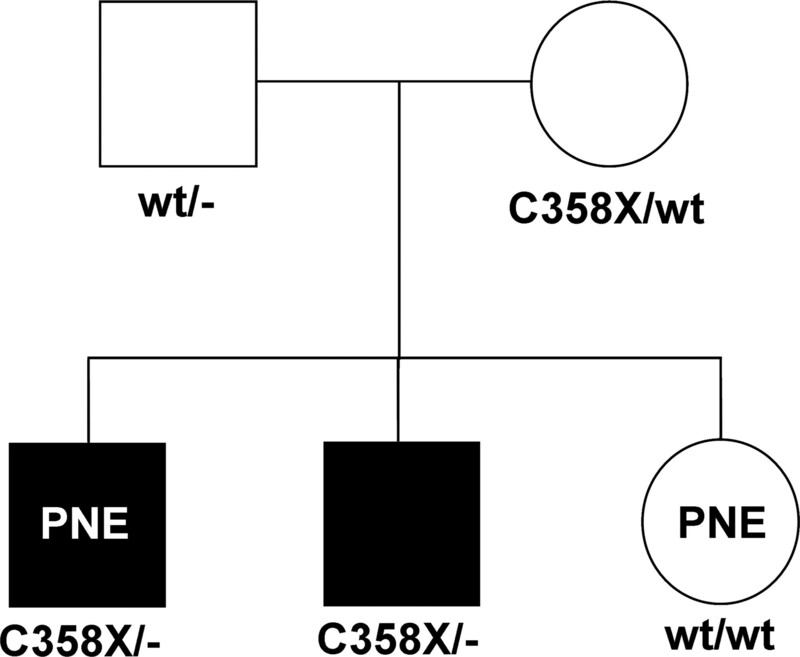 This study identified a family in which one child displayed PNE and coexisting nephrogenic diabetes insipidus, as a result of a novel nonsense mutation in the V2R gene (C358X). Cell-biologic investigations revealed that V2R-C358X is retained in the endoplasmic reticulum and is unstable, which explains his nephrogenic diabetes insipidus. Consistently, extrarenal V2R-mediated responses were absent in the patient who was treated with desmopressin. Administration of desmopressin, however, changed his PNE into nocturia, because he now still voided unchanged high urinary volumes at night but woke up and went to the bathroom. Withdrawal of desmopressin was accompanied by bedwetting, whereas reintroduction again relieved the symptoms. Therefore, these data indicate that neither a functioning renal concentration system nor a functional V2R is needed for the therapeutic benefit of desmopressin in PNE. Rather, it suggests that another vasopressin receptor and other organ(s) is the target for desmopressin to relieve PNE. The major role of the vasopressin type-2 receptor (V2R) is the regulation of the body water homeostasis by determining the level of reabsorption of water from pro-urine through aquaporin-2 (AQP2) water channels. In states of hypovolemia or hypernatremia, as well as during sleep when there is functional antidiuresis, the release of the antidiuretic hormone arginine-vasopressin (AVP) from the pituitary is increased. Upon binding of AVP to its V2R, it activates adenylate cyclase via a stimulatory G protein. The subsequent increase of intracellular cAMP induces protein kinase A to phosphorylate, among other proteins, AQP2, which is then redistributed from intracellular vesicles to the apical membrane. Driven by the sodium and urea gradient, water is subsequently reabsorbed from the pro-urine through AQP2, resulting in concentrated urine. Removal of AVP reverses this process, restoring the water-impermeable state of the apical membrane and occurrence of diluted urine. Mutations in the human V2R result in X-linked nephrogenic diabetes insipidus (NDI), a disorder in which patients are unable to concentrate their urine in response to AVP, resulting in the excretion of large volumes of diluted urine (1–3). Primary nocturnal enuresis (PNE) is defined as the persistence of nightly bedwetting in children who are at least 5 yr of age and is one of the most frequent complaints in pediatric and urologic practice. Although the frequency of enuretic episodes in a child is not clearly defined, at least three episodes per week in a patient who has never been continuously dry for longer than 6 mo is generally accepted for the diagnosis of PNE (4,5). Despite a maturation rate of 15% per year, 0.5% of all cases remain in adulthood, with serious effects on self-esteem (6). Among various hypotheses on the pathophysiology of PNE, it has been proposed that patients with PNE have insufficient nightly increase of AVP, leading to the production of large amounts of dilute urine, thereby surpassing the bladder capacity (7). Successful application of a synthetic analogue of AVP, desmopressin (dDAVP), a V2R agonist, seemed to confirm this hypothesis. One of the major criticisms of this concept, however, is that patients with PNE do not wake up before, during, or after voiding, which is difficult to explain by an increased urine production or by a small functional bladder capacity. Here, we describe the identification of a family with two brothers with NDI as a result of a mutation in the V2R gene (Xq28) leading to a premature stop codon (C358X) in the V2R protein. Besides NDI, one patient also experiences PNE. Administration of desmopressin and the use of alarm treatment relieved PNE completely, whereas NDI remained unaffected. Cell biologic characterization of this novel mutation revealed instability and retention in the endoplasmic reticulum of the mutant V2R protein, thereby explaining underlying NDI. These findings not only exclude a functioning urinary concentration system as a prerequisite for the beneficial action of desmopressin in PNE but also reveal that this effect is V2R independent. Serum and urinary electrolyte levels and osmolalities, vasopressin levels, and body weight and BP were measured by standard procedures. A thirst trial with additional infusion of desmopressin (0.3 μg/kg body wt) at 7 h after the start of the thirst trial was done as described previously (8). According to established standards, the test was stopped when clinical symptoms such as severe arterial hypotension and tachycardia occurred for more than three subsequent measurements or when body weight was reduced by >10% during the trial. The activities of von Willebrand factor and clotting factor VIII were determined as described previously (8). When the indomethacin (3 mg/kg body wt per d) and hydrochlorothiazide (HCT; 1 mg/kg body wt per d) treatment was started, it reduced urinary volumes by approximately one third (daytime output 5.1 ml/kg body wt; nighttime output 5.0 ml/kg body wt). Parent's informed consent was obtained for all studies, and all clinical experiments were performed in accordance to the Declaration of Helsinki. Isolation of genomic DNA, amplification of the V2R coding regions, and sequence analyses were done as described previously (9,10). The pEGFP-N1-wtV2R expression construct was a gift of Dr. Alexander Oksche (FMP, Berlin, Germany). To allow N-terminal detection of the V2R, a FLAG-tag was fused to the N-terminus using the PCR with the sense primers 5′-ATGGACTACAAGGATGACGATGACAAGACCATGCTCATGGCGTCCACCAC-3′ (FLAG-encoding sequence in bold) and the antisense primer 5′-GCTGAGAAGGAGCGAGAAG-3′. In a second PCR reaction, using the same antisense primer and the sense primer 5′-GTCTACTCGAGCCACCATGGACTACAAG-3′, an XhoI site and the Kozak sequence (indicated in bold) were added to the 5′ end of the first PCR product. The resulting 529-bp PCR product was cut with XhoI and PstI and cloned into the XhoI/PstI digested pEGFP-N1-V2R construct to yield pEGFP-N1-FLAG-V2R. Site-directed mutagenesis was performed on pEGFP-N1-wtV2R as described previously (11) using the sense primer 5′-CAAGATGAGTCCTGAACCACCGCCAGCTC-3′ (C358X; mutated codon indicated in bold) and its complementary antisense primer. After correct clones were digested with HindIII and BamHI (C358X), the mutation-containing fragment was isolated and cloned into the corresponding sites of the pEGFP-N1-FLAG-V2R. Sequence analysis of selected clones confirmed that only the desired mutations were introduced. Maintenance of MDCK type I cells and generation of stable clones were performed as described previously (8). COS-M6 cells were maintained and transfected with 1 μg of expression construct (unless indicated otherwise) as described previously (11). Before analysis, COS cells that transiently expressed FLAG-wtV2R-GFP or FLAG-V2R-C358X were seeded in six multiwell plates (Costar, Cambridge, MA), and grown for 2 d.
Transiently transfected COS cells were trypsinized and subsequently counted. Total RNA of 5 million cells was isolated using the RNeasy kit (Qiagen, Hilden, Germany) according to the manufacturer's protocol. Ten micrograms of total RNA was run on a 1% Agarose/MOPS gel with 7% formaldehyde and subsequently transferred to a nitrocellulose blot. V2R mRNA was detected using a [32P]-labeled cDNA probe of 0.65 kb corresponding to the PstI-HindIII fragment of the V2R coding sequence. PAGE and immunoblotting were performed as described previously (12). Immunodetection was performed using 1:5000 diluted peroxidase-conjugated mouse anti-FLAG antibodies (Sigma, St. Louis, MO). Immunocytochemistry and confocal laser scanning microscopy were performed as described previously (12). For immunocytochemistry under nonpermeabilized conditions, cells were incubated for 1 h at 4°C with 1:100 diluted mouse anti-FLAG antibodies (Sigma) in PBS supplemented with 1 mM MgCl2 and 0.1 mM CaCl2. As secondary antibodies, 1:100-diluted goat anti-mouse coupled to Alexa-594 (Molecular Probes, Leiden, The Netherlands) was used. The oldest son of a white, nonconsanguineous family was born in the 34th week of gestation (Figure 1). Polyhydramnios was noted during pregnancy. After birth, the child developed poorly with vomiting and repeated episodes of hyperpyrexia. Age-related height and weight remained below the third percentiles. High serum sodium (serum Na+ 158 mmol/L) and polyuria (8.2 ml/kg body wt per h) pointed to a renal concentration defect. To establish whether our male proband had NDI, we performed a first thirst trial combined with desmopressin infusion when he was 4 yr of age. This revealed unchanged urinary osmolalities between the start (235 mosmol/kg H2O) and end (229 mosmol/kg H2O) of the treatment. Table 1 displays the biochemical and physiologic data during this thirst trial. For confirmation of the diagnosis of NDI in the absence of mutation analysis, which was not available at that time, two subsequent thirst-desmopressin trials were done at 4.5 and 5 yr of age. These revealed urinary osmolalities of 112 and 101 mosmol/kg H2O (trial 1) and 150 and 138 mosmol/kg H2O (trial 2) before and after treatment, respectively. On the basis of these data, NDI was diagnosed. The child was started on HCT and indomethacin after the last thirst trial was completed, and the diagnosis of NDI was established. For further determination of whether daytime and nighttime urine volumes differed with the patient under adequate NDI treatment, 12-h diurnal and nocturnal urine volumes were measured on repetitive measurements (four samplings) over a 12-mo period. However, the median diurnal (8.5 ml/kg body wt; range 6.9 to 11.2) and nocturnal (8.8 ml/kg body wt; range 5.2 to 11.4) urine volumes did not differ. Note that measurements were used only when bedwetting had not occurred during the night. Pedigree of the family. ▪, Patients with nephrogenic diabetes insipidus (NDI). PNE, primary nocturnal enuresis; wt, wild-type. The vasopressin V2 receptor (V2R) gene is located on the X-chromosome; therefore, male family members have only one copy of the gene. X-linked NDI is due to mutations in the V2R gene, whereas mutations in the AQP2 water channel gene cause autosomal NDI. Besides their ability to induce urine concentration, AVP and desmopressin are known to increase levels and therewith the activities of von Willebrand factor and blood clotting factor VIII in plasma. Because this occurs through activation of the V2R, this response is absent in patients with inactivating mutations of the V2R gene but is unaffected in patients with NDI and AQP2 gene mutations (8). To discriminate between these two, we therefore these factors measured after infusion of desmopressin (0.3 μg/kg body wt). However, no changes in the activity of von Willebrand factor and clotting factor VIII were found (Figure 2), which indicated that a V2R defect is the molecular cause of NDI. Activity of von Willebrand factor and clotting factor VIII (%) after dDAVP infusion (0.3 μg/kg) in the patient with PNE-NDI. 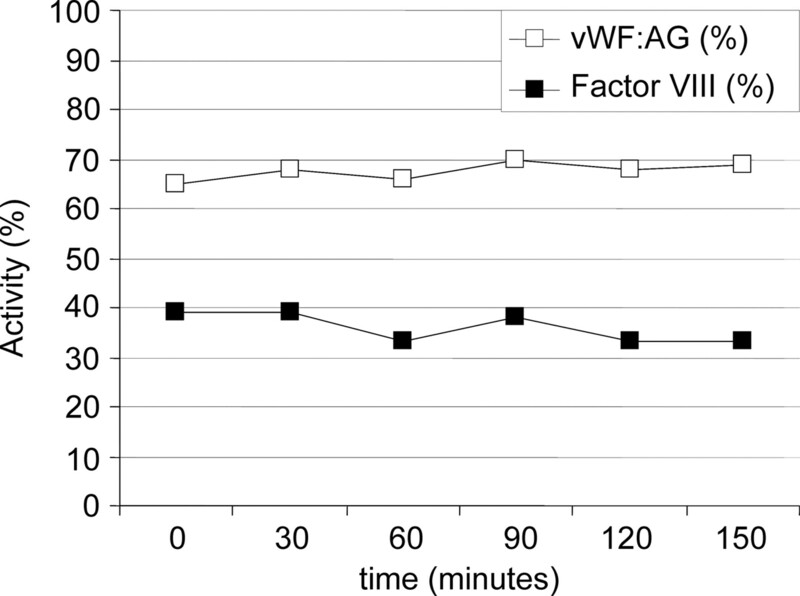 At time 0 min, desmopressin (0.3 μg/kg body wt) was infused, followed by measurement of von Willebrand factor and clotting factor VIII responses at the indicated time points. Methods after Bichet et al. (8). Ever since birth and despite the indomethacin/HCT treatment started at age 5, the patient wet his bed at night without waking up. At the age of 10 and during an observation period of 3 mo, he wet his bed on average at least three times per week (as assessed by a chart completed by the parents; Table 2), consistent with the diagnosis of PNE. Then, desmopressin administration (20 μg intranasally before going to bed) was initiated 1 mo after indomethacin and HCT administration was stopped. After 3 d, the child did not wet his bed anymore but woke up and went to the toilet instead. Withdrawal of the medication after 3 mo of dryness resulted in recurrence of PNE, whereas reintroduction after 4 wk again led to disappearance of PNE. The treatment left the urinary volume unchanged (before 9.1 ml/kg body wt per h [9.0 daytime and 9.2 nighttime] and 9.3 ml/kg body wt per h during treatment [9.2 daytime and 9.4 nighttime]). Reintroduction of indomethacin and HCT treatment, together with desmopressin, reduced urinary volume again by approximately one third. The number of enuretic events during the various periods is given in Table 2. For identification of the V2R gene mutation, sequence analysis of the V2R gene was done. Genomic DNA analysis of the patient revealed a mutation at nucleotide position 1074 (NM_000054), substituting a cytosine for an adenine (NM_000054). This substitution leads to the introduction of a premature stop codon (C358X) in the extreme C-terminus of the V2R. His brother, who also has NDI, harbors the same C358X mutation, and neither showed increased activity of blood clotting factors upon desmopressin administration (data not shown). In contrast to the proband, he did not wet his bed after 4 yr of age but went to the toilet three to five times every night for voiding. The sister of the proband also experienced PNE but had no signs of impaired renal concentration ability in a concentration test, and sequence analysis did not reveal a mutation in her V2R gene (data not shown). Initiation of desmopressin administration (20 μg intranasally) resolved her PNE. For determination of the molecular cause of NDI, MDCK cells, which are an appropriate model for renal principal cells (13), were stably transfected with constructs that encode wild-type V2R or V2R-C358X. Both were N-terminally fused to a FLAG (F) epitope tag to allow detection (from the extracellular side). Under conditions that would allow detection throughout the cells, F-V2R expression was easily detected in the basolateral membrane of many stably transfected clones, whereas F-V2R-C358X expression was not observed (data not shown). This suggested that V2R-C358X is unstable. For further investigation of this, COS cells were transiently transfected with expression constructs that encode F-V2R-GFP and F-V2R-C358X. Here, the green fluorescence protein (GFP) cDNA was cloned in frame at the C-terminus of F-V2R and F-V2R-C358X, which, as a result of the stop codon in F-V2R-C358X, would yield expression of green F-V2R only. Two days after transfection, the cells were incubated with anti-FLAG antibodies in ice-cold PBS for 1 h to label only V2R at the cell surface and fixed. Parallel-transfected cells were fixed, permeabilized, and incubated with anti-FLAG antibodies to stain V2R at any location. Subsequently, all cells were incubated with secondary antibodies and subjected to immunocytochemistry. Confocal laser scanning microscopy analysis revealed that F-V2R-C358X was not expressed at the cell surface, whereas the F-V2R showed clear membrane localization (Figure 3, left). 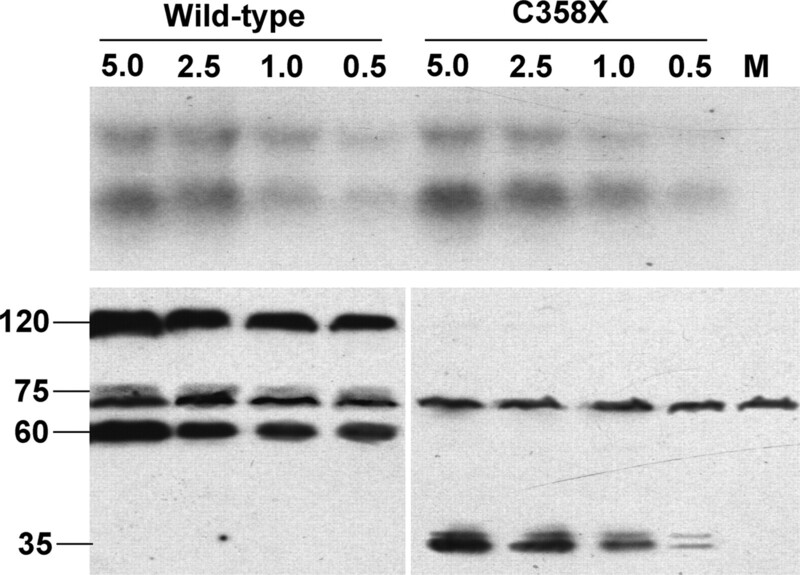 Analysis of permeabilized cells, however, showed expression of F-V2R and F-V2R-C358X, indicating that V2R-C358X was retained in the cell and that the lack of plasma membrane expression of V2R-C358X was not due to the absence of expression (Figure 3, right). This explains the NDI phenotype in the patients, because intracellularly retained receptors are not accessible to AVP and, thus, also not to desmopressin. V2R-C358X is not expressed in the plasma membrane of COS cells. Nonpermeabilized or permeabilized (indicated) COS cells that transiently expressed FLAG-V2R-C358X or FLAG-V2R-GFP were subjected to immunocytochemistry using anti-FLAG antibodies, followed by confocal laser scanning microscopy. To determine semiquantitatively whether V2R-C358X is unstable, we analyzed the expression of F-V2R-GFP and F-V2R-C358X, normalized for their amounts of mRNA. For this, we transiently transfected COS cells with different amounts of F-V2R-GFP or F-V2R-C358X expression constructs. After 2 d, cells were lysed for immunoblotting or total RNA was isolated and subjected to Northern blotting. As shown in Figure 4, for similar or somewhat higher levels of F-V2R-C358X mRNA compared with that of F-V2R-GFP (Figure 4, top), the expression levels of F-V2R-C358X (35 kD) were clearly lower than those of V2R-GFP (60 and 75 kD; Figure 4 bottom). In fact, the expression of F-V2R-GFP stayed relatively constant with decreasing amounts of mRNA, whereas the F-V2R-C358X levels rapidly decreased, which underscores the instability of V2R-C358X compared with wild-type V2R. FLAG-V2R-C358X is an unstable protein. COS cells were transiently transfected with decreasing amounts of expression constructs for FLAG-V2R-GFP or FLAG-V2R-C358X (indicated). Subsequently, mRNA was isolated and subjected to electrophoresis followed by Northern blotting. V2R mRNA was detected using a radioactively labeled V2R probe (top). Of cells transfected in parallel, lysates were generated and analyzed by PAGE followed by Western blotting. FLAG-V2R-GFP and FLAG-V2R-C358X were detected using anti-FLAG antibodies. Approximate masses (in kD) of the observed bands are indicated on the left. M, mock (transfected). Note the aspecific band of 70 kD. As found by others, the 120-kD band likely represents a dimer of V2R. Although PNE is common and extensively studied, the cause of its inherited or sporadic forms remains unknown (14). Three entirely different therapeutic options (alarm treatment, tricyclic antidepressants, and desmopressin) have been demonstrated as being highly efficient in prospective controlled trials, but, regardless of dosage, a group of nonresponders exists for all treatments. Therefore, for obtaining more insight into this complex disorder, attempts have been made to subgroup PNE. One classification has been made on the basis of nocturnal urinary volume or functional bladder capacity and their response upon desmopressin treatment (15). This drug has been used successfully since the 1970s for the treatment of PNE with the rationale of increased distal tubular water reabsorption and a consequently reduced nightly urinary volume. This concept has later been fueled by a study that demonstrated an insufficient nightly increase in endogenous AVP in some patients with PNE, leading subsequently to high urinary volume of poorly concentrated urine (7). Consequently, a low functional bladder capacity would be rapidly surpassed during sleep, leading to enuresis, which is reduced by desmopressin. However, several investigators were not able to divide patients with PNE into such subgroups or to find positive correlations for urinary volume and vasopressin levels as predictors for the desmopressin response in PNE (16). In addition, the largest study on PNE and desmopressin treatment showed that only dosage, low voiding frequency, and older age are favorable factors for dryness upon treatment (17). Therefore, the Standardization Committee of the International Children's Continence Society has recently questioned the clinical usefulness of such subgrouping approaches (18). Another hypothesis to explain the cause of some PNE is detrusor-sphincter dyssynergies and bladder instability, because some patients with PNE benefit from treatment with anticholinergics drugs, such as oxybutynin. However, a confounding factor here is that these patients also have daytime symptoms and are therefore not monosymptomatic. Also, several studies have suggested a role for idiopathic hypercalciuria in PNE (19,20). This hypothesis, however, is also highly disputed, because others came to opposite conclusions (21). For all of these hypotheses, however, it is difficult to rationalize how desmopressin, the alarm, and tricyclic antidepressants would relieve nocturnal enuresis if nocturnal enuresis would have a common cause. This study and another recent study of ours provide data that desmopressin, the alarm, and tricyclic antidepressants may act on the same tissue/organ. We showed that two patients with PNE and co-segregating NDI as a result of a mutation in the AQP2 gene responded to the treatment with desmopressin (22). Although these patients still had large nocturnal urinary volumes, they aroused on the sensation of a full bladder and went to the bathroom with desmopressin treatment. In this way, desmopressin has converted PNE into nocturia. Because these patients have an impaired renal urine concentrating mechanism, reducing the urine volume does not seem to be essential for the therapeutic effect of desmopressin. However, because activation of the renal V2R also stimulates sodium and urea uptake (23,24), a remaining role for renal V2R could not be completely ruled out. In this study, we have identified a (novel) V2R mutation as the underlying cause of NDI in a family, because dehydration combined with desmopressin administration did not reduce the urine volume or increase the blood levels of clotting factors in the patients with NDI. Average urinary osmolalities were as expected for congenital NDI, and a significant renal concentrating ability could be excluded. The molecular characterization of the mutant V2R demonstrated that the encoded protein is unstable and does not reach the plasma membrane, where it is normally bound by AVP or desmopressin to induce the intracellular cAMP signaling cascade. Of further importance, one of the NDI-affected boys also experienced PNE. Considering the nonfunctional V2R and the repetitive replacement of PNE by nocturia after initiation of desmopressin treatment, our data clearly indicate that the V2R is not essential for the action of desmopressin in the treatment of PNE. It has been noted that a placebo-drug effect in PNE is not negligible. Although we cannot rule out such an effect here, the rapid recurrence of PNE upon withdrawal and its disappearance again by reintroduction of desmopressin indicate that the relief of PNE in our patient with PNE-NDI depends on drug application. Moreover, PNE in our patient seems unrelated to hypercalciuria, because urinary calcium levels in our patient were low (Table 1). Although desmopressin will reduce the nightly urine volume in patients without NDI-PNE and our data are derived from one patient only, our results indicate that the success of desmopressin in PNE involves neither the renal concentrating mechanism nor the V2R. It is unclear which receptor/tissue is involved in this effect. Possibly, desmopressin acts on a protein in the spinal cord or the neural network of the bladder and the urethra, because these tissues have been suggested to be involved in nocturnal enuresis (25). More likely, however, desmopressin increases arousability by acting on a non-V2R in the central nervous system, because the alarm treatment and tricyclic antidepressants act on the central nervous system, and increasing evidence is obtained for a delayed central nervous cortical and brainstem maturational function in children and adolescents with PNE (26–29). If this holds true, then one of the best candidate proteins for mediating the action of desmopressin in nocturnal enuresis is the human V1b receptor, because this protein has a similar affinity for desmopressin as the human V2R and is localized in the brain (30,31). Determination of an involvement of the V1b receptor in PNE has to await Food and Drug Administration–approved specific agonists for this receptor. This project is supported by a grant from the Dutch Kidney Foundation (PC104) to P.D. and N.V.K. J.R. set up the techniques to investigate V2R, set out design of cloning and analysis, and interpreted the in vitro data; M.S. performed cloning of DNA and transfection of cells; N.V.K. participated in writing the report; P.E. was the treating physician involved in making the diagnosis; P.D. supervised the cell biological work and wrote the report; and D.M. supervised the clinical work and wrote the report.